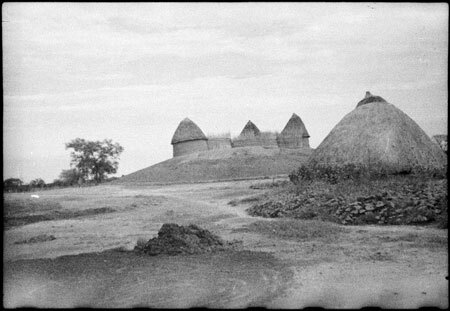 A view of a cluster of huts comprising the homestead of the Shilluk king or Ret, who lived at Fashoda (now Kodok) on the Nile. The Shilluk Ret was an absolute monarch who held great sway over the Shilluk people's lives. The defensive mound on which the homestead is placed is possibly related to the tradition of intense royal rivalry to the title of Ret. Morton, Chris. "Shilluk Ret's village" Southern Sudan Project (in development). 03 Jan. 2006. Pitt Rivers Museum. <http://southernsudan.prm.ox.ac.uk/details/2004.130.36711.1/>.